Well, that was an adventure. I hemmed both pieces all the way around prior to dyeing, because I had time before I could go dye shopping. This might not have been the best idea. Same. Darn. Thing. Only now with a few color blotches. Sigh. I went ahead and used the grey fabric. Pinning the orange "interfacing" to the longer grey "undertunic" was harder than I expected. Here is where pre-hemming the fabric was a bad idea, as the edges did not always exactly line up. I did my best to fold and fiddle things into alignment. I sewed around the neck slit first, cut it open, flipped the orange through, and then sewed down the orange on the outside. The neck slit wanted to rip, so I reinforced each end with some buttonhole stitch (on my machine). I suspect on the original, this was woven in. I turned it inside out again and sewed up one side, keeping about a 5/8" seam allowance except where I wanted the armhole to stop. I angled out to the very edge of the fabric there. See, since the layers were already hemmed, I wouldn't be folding them under. If I'd just stopped without angling it out, there would have been a 5/8" step from the seam to the sleeve. Turning it right-side out, I laid the yellow ribbon down along the waist at this point. I used a commercial yellow satin ribbon, I think 1.25" wide. Obviously not period, but I was not up for dyeing a long strip of cotton yellow just for this. Inside out again, to sew up the other side and tuck the ribbon edges under themselves to prevent fraying. Then, because the hem wasn't even, fold up one side so that it was. My wool felt arrived in time. I blew up the image of the cat and used it as a pattern. The yellow eyes were more of the yellow ribbon, stabilized with Wonder-Underish stuff. The cats were all sewn together. I have lots of experience sewing felt faces, thanks to my son's insatiable need for felt plush toys! Yellow eyes to red eyes to face; white teeth to red mouth to face. I considered needle-felting the pieces together, but I don't have a lot of experience with that, and the examples I've seen of it didn't have crisp lines. It was at about this time that I stopped to wonder if these were jaguars. I still don't know a lot about Incan culture, but I'm pretty sure jaguars were sacred animals. Was I making the equivalent of priestly vestments for casual wear? I did a quick Google search for jaguars in Incan art. They uniformly look different, with large fangs always represented at either side of the mouth. Plus, there are several species of smaller wildcats in South America. The Pampas cat can have a black coloring, and its (modern) range includes the Rio Ica region where this tunic is from. So... okay. I might still be doing something wrong, but at least it's not the sort of big, obvious thing. The only thing left was to attach the cats to the tunic. I seem to have gotten the proportion slightly off - when I positioned the cats with their faces about the right distance apart, I had more margin by the sleeves. I am okay with that. One cat got sewed down. I got impatient with the other cat and Wonder Under-ed it. Wikipedia and other lousy Internet sources describe the llawt'u headdress as 'cords wrapped around the head' or 'a turban.' Most of the images on the Internet are only from the front, and show something like a wide headband. Sometimes there are ornaments at the center forehead. I found some great pictures of Inti Raymi, a re-enactment of an Incan sun festival in Peru. While many of the photos center on the more spectacularly-dressed nobles, here are as close to some 'regular guys' as I could find. In one or two images, I thought I saw a simple tie in the back. I tried a Storvik llawt'u, with a red and white striped band and a drekkar ornament. It... did not really go with the tunic. At all. So I got a piece of trim with appropriate-ish geometric designs. The feathers were bought for quill-making but have found new life. Fringe at knees and/or ankles seems to be a thing in the pictures from the manuscript linked to last time. I bought some nylon fringe in red - doesn't really go with the tunic but I also wanted fringe for another project and red it is. I stripped some of the fringe from the ends of two lengths and tied them on at the knee. Sandals were of llama rawhide. Not having any to hand, I'm substituting in a pair of Roman (?I think? Sylvanus Perrin made them ages ago) leather sandals. I also found a pair of gold leaf-shaped earrings - big round circles would be better, but I don't have any. 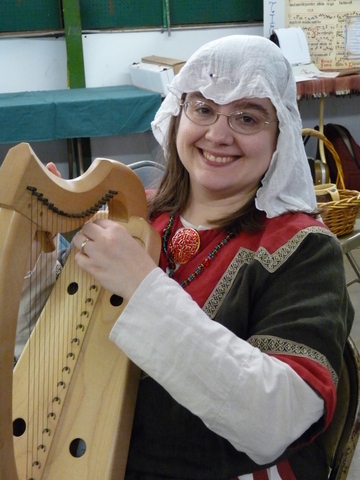 Last Friday night, at the bardic circle at Battle on the Bay, there were several newcomers. I thought, "What songs did I like hearing when I was new to the SCA?" In the East at that time, "The Scotsman" ("A Scotsman clad in kilt left a bar one evening fair...") was so popular that within a year or two, it ended up on the "For the love of Mike, sing something ELSE" list. I haven't heard it sung in a while, so I trotted it out. As a joke, it's wonderfully constructed. The blue silk ribbon sneaks in with nary a hint that it'll be a first-place award in the punchline. It almost always gets a laugh. So it was a little disconcerting when it came to me, all in a rush, that this is a joke-song about sexual assault. Seriously. Swap the genders. A drunk woman passes out, and two men look up her skirt and leave evidence that they'd done so. That's not a joke, that's the six o'clock news. And if it's not okay to do to a woman, it's not okay to do to a man. But it's just a jooooo-oke. Can't we make fun of anything anymore? Did you know that over half of all sexual assaults in the US military are man-on-man? Tea-bagging counts. "Mushroom tapping" counts. And, as rare as it is for a woman to report a sexual assault, it's even rarer for a man to. It's just guys being guys. What, are you a wuss or something? Jokes like this are another way of signaling that sexual assault doesn't need to be taken seriously. No big. Betcha wish you hadn't been passed out, eh? Rather be awake for that, yeah? At least then you could have consented. That's not the point of the song. No, it's not. I don't think it's meant to do anything but make people laugh. But 40 years on, it's getting clearer that really, it's not actually funny. If the culture took sexual assault more seriously, maybe this could exist as a clear case of fantasy. I know a joke whose punchline is "The American doctor thought for a moment, then took the American lawyer and threw him out the [airplane] window." It's a Readers Digest joke, not all that great, and OMG it advocates murder! Except not really. In real life, there is no question that defenestrating people out of airplanes is not okay. In real life, there are questions about whether or not some kinds of sexual assault are real or not. OMG who made you the Song Police. Nobody. I'm not the Song Police. I won't stop anyone from singing this. I won't even get up in their grill about "what you're really singing about." But I think I've performed it for the last time. Yesterday, my blog analytics showed me a few hits to an old essay of mine, "Authenticity and Me, 2001." Now, I chose to put that essay up on this site in 2008-ish, so a slightly more recent past-me approved it, but I still get a slight knot of anxiety when I see something like that. Holy cow, that was 15 years ago! What if I was young and dumb? What did I say? So I reread it, and I'm relieved to find that I think I still believe it's mostly true. In summary: I wrote that period bardic performance is awesome, but it would be a shame to have no bardic performance at all, if we insisted on Only Period Performance. That's pretty much the SCA's strategy, after all. Make "an attempt at pre-17th century" whatever - garb, food, gear, entertainment - and you're good. We welcome the novice, the curious, the dabbler, and the people with strong interests in one area but not another. We are a big-tent organization, and it's one of our strengths. I think I have only one real update to add since 2001. It's important to understand why modern folk performance has such a hold on the SCA at large. My hypothesis: All of us live in the modern world, and we are soaking in modern music. It is used by everyone from advertising jingle writers to pop musicians to movie score composers to hymn writers to Broadway shows to elicit emotional response. Now go ask some Scadians why they like bardic circles. A substantial fraction will say something along the lines of "it offers a moment of transport" - it elicits a feeling of being long ago and far away. This is what we imagine the Middle Ages to feel like. We want the entertainments at the bardic to conform not to what the Middle Ages were, but - as we are fond of saying - the Middle Ages as they should have been. (Or perhaps how we imagine them to be.) We want to hear SCA hymns, songs of praise to the values of courtesy, honor and chivalry upon which our Society is based. Or SCA anthems, songs uplifting our kingdom and the people who dwell there. And most importantly, we want these things to be presented in the musical language that knows how to touch our hearts. And that is a modern musical language. I love period music and period performance. I do think there is a path that can tread between these two goals - period performance and pulling modern heartstrings - but it's difficult to find and to navigate. It's already hard to write a song that resonates strongly across a kingdom; it's even harder to write that song in a period style. This is why modern performance remains so extremely popular, and why the bardic arts lag so many others when it comes to progress towards period. Even cooking, which is also a matter of taste, has stepped up its game enormously since I joined the SCA 20 years ago. We learned to value medieval flavors and textures on their own merits, and as we ate these foods together in community, I suspect they began to acquire their own socio-emotional significance. Still, I doubt very many people ask for a Tart in Ymbre Day when they need comfort food. I don't say any of this to discourage period performance or to write it off as impractical. I encourage it and practice it. However, once I realized why modern performance remains so popular - because it fills an important emotional need - I became much more at peace with its dominance. When period performance can feed that same emotional, or even spiritual, hunger, then it has a chance of assuming pride of place. Until then, it's a pleasant educational diversion or interesting background music - but it will not be the song of our SCA lives. In Part One, I suggested that awards in the SCA serve three purposes: to support our shared values, to recognize volunteers, and to inspire the populace to move toward lived expressions of the shared values. In Part Two, I asserted that, given these purposes, it was entirely reasonable for people to aspire to be worthy of - or, colloquially, "to want" - these awards. In Part Three, I'll talk about why that may not be the best idea (despite being reasonable and not dishonorable) and what you might do instead, to ensure greater sanity and happiness. --"The Enchiridion," Epictetus, c. 135 CE. The SCA awards process does not work like, say, academia. In the ivory tower, you proceed through a series of well-defined (and sometimes accredited) courses; you take exams to prove that you understand the content; then, when you have done this enough times, you are awarded a degree. There are many records, and an entire infrastructure (e.g., the registrar) set up to handle them and to ensure compliance. There is no way we could implement such a system in the SCA, not without greatly changing the character of the Society. Some of our great strengths, in my opinion, are our "big tent" nature and our "just enough" organizational structure. Trying to shoehorn everything we do and everything we love into quantifiable categories would not turn out well. And I say this as a big fan of shoving things into categories. We are left with a process that is inherently subjective, and which relies upon people to happen to notice others' good works. What's more, as we have grown larger and larger, it gets harder and harder to know who has already been recognized for what. Sure, that information is online in the Order of Precedence, but you have to think to check that. People assume that, because someone has been doing something for a long time, of course they've been recognized for it. There is nothing malicious in this. I want to stress that. I'm not talking about Dark Whispered Conspiracies to keep awards away from people. I'm talking about the natural, entirely understandable problems in our current system, mostly resulting from assumption and inertia. We are all very busy people, inside the SCA and out of it, with many obligations much more pressing than worrying about the status of other people's awards. What could you do with an award that you can't do today, without one? Would it really change how you play in the SCA? For most people, I suspect the answers are "I dunno... participate in pollings?" and "No." Yes, there is a modicum of automatic respect given to Peers, but (at least in the places I have lived) it hardly seems game-changing. So I think many of us are looking more for the message that what we do matters, that it was noticed, that it (and we) are good enough, rather than wanting an award for the award's sake. The award itself doesn't do so much. So I turn to the hoary old advice to "Do what you love and forget about awards," but coming from a different place. When I've heard that advice before, it's had the unspoken undertone "because good and nice people don't want awards, they are selflessly giving without thought of recognition." I've already said that I think it's entirely natural to want an award, and not at all a sign of deficient morals. But, like my buddy Epictetus up there says, whether or not you actually get an award is out of your hands. I say, forget about awards because wanting one and not getting it can make you unhappy or bitter. Instead: Do what you love, and seek your validation elsewhere. (Because, even though it's another thing we technically can't control, most of us do want validation of some kind.) Do the people you play with - the people you actually see at events - do they thank you? Do they appreciate what you do? Do they find you to be honorable and trustworthy? Courteous and valiant? Knowledgeable and wise? Hard-working and reliable? Then know that you are appreciated; you are valued; you are loved. At least for myself, I have found much greater peace of mind by learning to appreciate such local, personal tokens of respect, rather than looking to the Crown. I would not like to play in a group where I felt taken for granted, or ignored, or denigrated. I know by the faces and voices around me that I am not. And that is enough. If you wish to hear good things about yourself, say good things to other people. Be specific, be honest, and be genuine. Whenever possible, go to people individually. It is nice to hear the autocrat thank "everyone who helped today," but it makes a much firmer impression to get a concrete, individual message. Be generous. Don't flatter, but don't be stingy with thanks or praise, either. It does not diminish you to build others up. Notice small things: the cheerful person who always brightens events with her presence, the lovely encampment you're admiring, the musicians who played for the dancing, that guy who always puts cool articles up on the baronial Facebook page. Just because the award system isn't perfect, doesn't mean I think we should abandon it. If you're already thanking others for their work, you're paying more attention. Take the next step to confirm that they do/do not have the relevant baronial or kingdom awards, and put in a recommendation. Resubmit as needed. It's not wrong to want an award. But it's probably not productive, and it may make you unhappy. Do what you enjoy, in the amount that you enjoy it, in the way that you enjoy it, and look around yourself to know that the people close to you are glad that you choose to do so. Be warmed by that knowledge. If no one seems to appreciate your efforts, you have either fallen in with unpleasant people, or your efforts are more harmful than helpful. Either case is beyond the scope of this essay, but you may wish to speak to an advisor if you are uncertain about where the fault lies. In Part 1, I suggested three 'noble purposes' for awards in the SCA - to state and affirm community values, to recognize and appreciate member/volunteer efforts, and to inspire other members with the example of the person given the award. If that all sounds reasonable, let's continue with how we might expect these purposes to be achieved. Do Awards Serve Our Purposes? 1. Statement of Community Values - Yes! We are in the fiftieth year of a Society in which the task of organizing members is generally likened to herding cats. Interkingdom anthropologists tell us there are considerable cultural differences between kingdoms. And yet! We're still here. When we gather at large, interkingdom Wars, we seem to be generally on the same page. And in virtually all areas, we've upped our game. I cannot scientifically prove that the award system is mostly, or even partly, responsible for this, but my intuition is that it is a contributor. When it comes to true positives, the system works quite well. People did good work, good work got recognized, people feel valued. Huzzah! The system has some problems. For any gentle, there will be a space of time from when their works first reach the level when an award is appropriate, to when this is noticed, to when this is broadly agreed upon (for polling orders), to when the award is given. The longer this time is, the more likely the gentle will feel undervalued. Perhaps worse, there are certainly gentles whose presence enriches our events and our lives, yet who do not necessarily fit neatly into the usual award categories. There may be local or kingdom awards of courtesy or excellence that can be used, if the gentle's contribution is spotted. But if it's outside the typical things we look for, it can take an embarrassingly long time for the local population to realize that Bob the Kind-Hearted has no awards but really should. I have turned the problem over in my mind, but personally have not found a better system. I do have some auxiliary suggestions to amend both of these problems, which I'll discuss in Part 3. 3. Inspiration to Other Members - Yes! If we mean for awards, and those who hold them, to inspire the populace to act in ways consistent with our community values - why do we get so upset if someone says aloud that they aspire to a High Order? This was all a rather long way of saying that, if awards are meant to inspire, and they inspire people to aspire in the direction of those selfsame awards, it's really quite silly to judge those people poorly. Or, put another way: Why is "I'm Master Thomas' apprentice" okay, but "I want to be a Laurel" isn't? Finally, in Part 3 - Suggestions for improving happiness (your own and others') in the SCA, vis-a-vis awards, regardless of your station. Quite a while back, I promised some thoughts on awards in the SCA - specifically, on the taboos around aspiring to them. But before I get to that, I think it's valuable to look at the awards themselves, and why we have them. What we choose to single out as worthy of recognition speaks to what we value as a group: volunteerism, the right mix of scholarship and artistry, and chivalric martial prowess. These values aren't handed down from on high; they're what we've decided, over the years, that we want to recognize. You could imagine a group that instead specifically rewards in-persona activity, meeting recruitment goals, and fundraising. Or metahumor and the willingness to provide beer. Those would be very different groups. Even if all those things show up in the SCA, and are important to us to one extent or another, and some can even be recognized under some of our existing awards, they aren't explicitly called out as the most important things you could be doing. This is why the Master of Defense matters so much, and why the archers/thrown weapons/equestrians are already looking for their own High Order. Recognizing these activities, at the highest level, validates the various sorts of martial prowess as important parts of the SCA community. I use the term "volunteers" loosely, to encompass all the gentles whose work makes the SCA go 'round. That includes those whose volunteerism falls into the realm of the peaceful or warlike arts. We are a volunteer organization. While many of us volunteer with a glad and willing heart, nearly everybody likes to know that their efforts are appreciated. Awards are a gesture of gratitude from the larger organization toward the individual, saying, "Thank you for helping make us what we are." The High Orders, especially, are called upon to act as inspiration to others. Arguably, one does not need an award to act as an inspiration. (And in fact, already being a source of inspiration seems to be frequently called out as evidence that someone is fit to join the ranks of the Peers.) However, Order members (at the Peer or Kingdom level) are generally considered to have a responsibility for this, which is a step beyond informally having it be true. Next, let us consider how a member of the populace might respond to these purposes. So I had this idea today. I know there are other people in this area with a scholarly bent and an interest in the north-of-the-Alps, west-of-the-Rhine region (plus the islands) from the 4th through the 11th century. I assume that at least some of them are just as eager to geek out with like-minded people as I am. So why don't we do that? Call a symposium of sorts on a topic - everyone with interest/resources hauled them in next month, and just generally compare notes and answer questions. Workshop - like the symposium, but more hands-on. Group-led rather than teacher-led. Now maybe that results in some shuffling - it's my turn and I want Lady A to tell us all about insular calligraphy, but Lady A demurs that she hasn't the time to prepare that for next month, would the month after be all right? But no big deal, the person after me in rotation then picks what we do next month, and then Lady A does her calligraphy thing the month after. I think I would request regular attendance. Obviously, mundane or family concerns trump this sort of thing, but folks shouldn't skip out because Lord B wants to talk about knives and spears and that's not their thing. Lord B has enthusaistically participated in all the garb and jewelry and literature sessions, so now he deserves our attention and participation in his passion. This just sounds like a ton of fun to me. It's easier to write a quick post and use it to upload the PDF that way. And it serves as an annoucement of content. Do I want to post a rant on the way we handle awards in the SCA? Very touchy subject. It can be hard to discuss - in some quarters, any deviation from pure-hearted service without thought of recognition is instantly grasping, greedy glory-seeking, the hunt for honors unearned. Seriously, I think there's a middle ground there.